Arrive to a central hallway with striking black and white tiled floor and hanging space for your holiday kit. Lead through into open plan living space, this welcoming room offers a versatile hub for any occasion from celebratory suppers at the smart dining table, enjoying the local produce and getting creative in the fully fitted kitchen or simply relaxing with a good book. To the rear is bedroom one, a double bedded room with contemporary style ensuite shower room and double doors to the courtyard. Dressed in fresh white and blues, sink into luxury linens and comfort at the end of the day. Bedroom two is to the front of the apartment off the hallway and can be arranged as a twin or double bedroom to suit your party. The ensuite bathroom offers a larger rain shower. Lower Hillside has been thoughtfully considered for holiday guests with a cool relaxed ambience, stylish decor and ample storage. From the living space, double doors open onto a decked courtyard with colourful pots brimming with scented lavender, a small cafe table and 4 dining chairs encourages al fresco dining, a welcome oasis amongst the stone fishermans cottages. 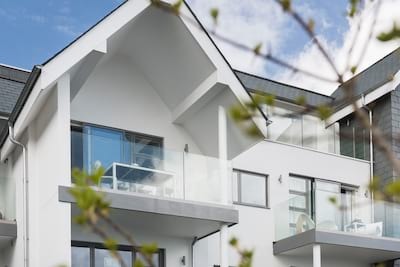 Lower Hillside has a luxury location with the hubbub of the harbour just a 2 minute walk away. St Ives offers a cool coastal Cornish vibe and gently blends the tradition of the fishing heritage with more modern order. Budding artists have made the town their home and a number of galleries are well worth a visit or explore the curio shops for that perfect souvenir. If beach days are of appeal then choose from up to 5 golden sandy beaches all within walking distance or head out along the coastal path heading further west around the island to Porthmeor and beyond. Food lovers will adore the choice of places to dine be it fish and chips on the quay or beachside fine dining, slap up pizza supper or simply a good pasty on a harbourside bench as you watch the world go by. Day trips to explore the county are an easy option with the myth and legend of Land's End within easy reach along the coast road or further North to Padstow and Fowey both charming coastal towns. Lower Hillside comes highly recommended to those looking for a central base in St Ives yet tucked away from the bustle. There is one allocated parking space for Lower Hillside. This is located on Talland Road, approx 5 minute walk from the property. The property is located on Skidden Hill which is steep. 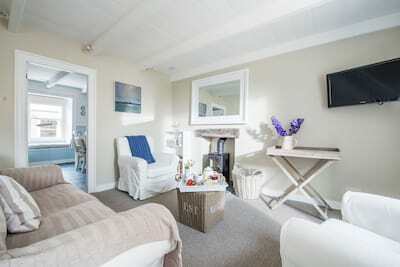 We enjoyed a lovely stay at Lower Hillside - the location was less than 5 minutes walk from the harbour front and station car park and the cottage was presented beautifully. Look forward to returning! 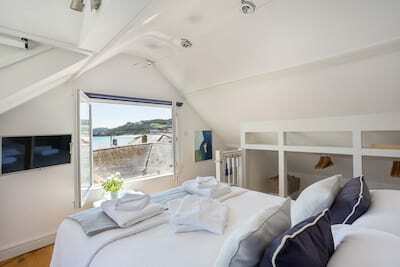 What a wonderful week in beautiful St Ives staying at the luxurious Lower Hillside apartment! Its location could not be better with a few minutes walk to the beach as well as to the High Street and restaurants. The apartment is decorated to a very high standard. We especially enjoyed the nautical theme! So many little touches made this the perfect base for the family for the week from the super speedy wifi to the coffee machine! An absolute pleasure to visit and such a shame to leave! We plan on returning and I can't think of anywhere we would prefer to stay! Thank you Cornish Gems, 5 stars for Lower Hillside! We loved staying at Lower Hillside. The location and accommodation was perfect for us. Great week. Lovely place, wonderfully appointed. Sharpest knives and most non stick frying pan ever! Showers were great too. The courtyard will be great in summer and the floors were great for our dog. It was beautiful.